The wind howled and the rain came down in sheets! 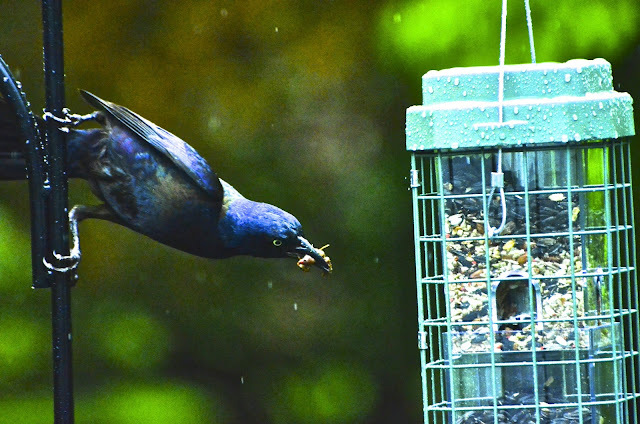 of this Grackle loading up on the food. after another, adding more food. See that kernel of corn he is now adding! And yet, that still wasn't enough. to add to his already overfilled beak. with all those yummy treats in his mouth. Now that's a mouthful. The blues are lovely. Such a piggy! Great shots! I wish I didn't have such a hard time loving grackles....piggy as they are! That is one stuffed beak!! Guess humans aren't the only ones who stuff themselves! LOL! 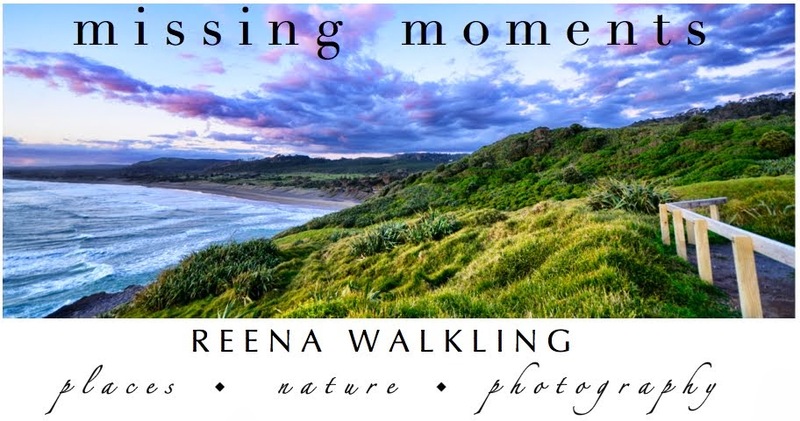 Fun shots for the day, Reena!! Reminds me a bit of myself!!! Wow, you have captured his iridescence, his spooky and mean look, his greediness, the pictures are wonderful, clear, and artistic. E.A. Poe would have love to illustrate one of his books with these. That is a beakfull. I've never seen a bird with a stuffed beak before. What a piggy bird. Actually, it's probably heading back to the youngsters to lay it out on the dinner table. What a treat!!! 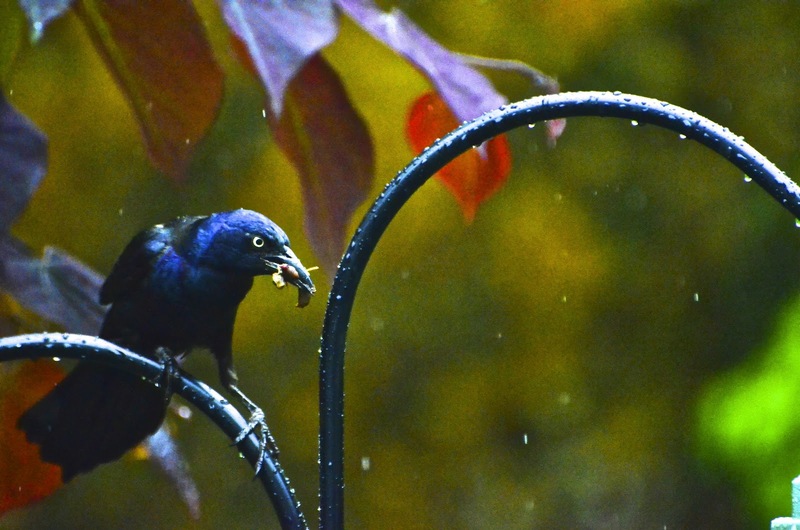 I haven't seen this done before...raining while a bird is eating....it really captures a unique mood in the pictures. I'll have to try it out this weekend. We are supposed to have lots of rain....hope you are adjusting back to home after your beautiful vacation! Such a beautiful blue! I bet it was gathering a feast for its babies!! How in the world...or why in the world...can that bird stuff so much in his beak? Maybe he/she was grocery shopping. I've seen people put more bags on their arms than that. I can't imagine he can fit any more in that cart. He's pretty clever. As a young kid we had an audio tape which was about a haunted house and it started with 'it was a dark and stormy night'. Your title made me remember it. 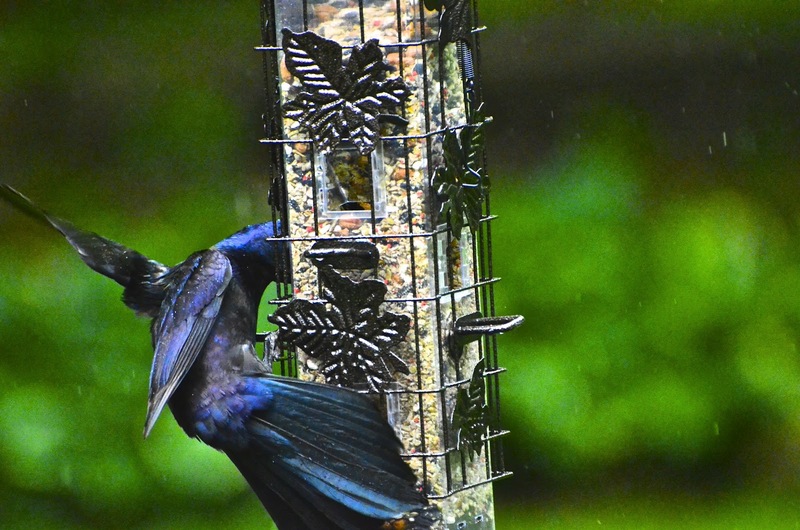 Those grackle photos are great, someone was hungry. MOL Ms Reena...his mom must not have taught him not to squawk with a full mouth. Great shots especially on the suet!! I got a kick out of this post, great series of photos. A grackle on a mission if ever there was one! I could be wrong but I am thinking that this bird is a little bit of a pig. Love you photos my friend. love those shots... the first most because of the dripping rain... is a grackle related to the crow family? 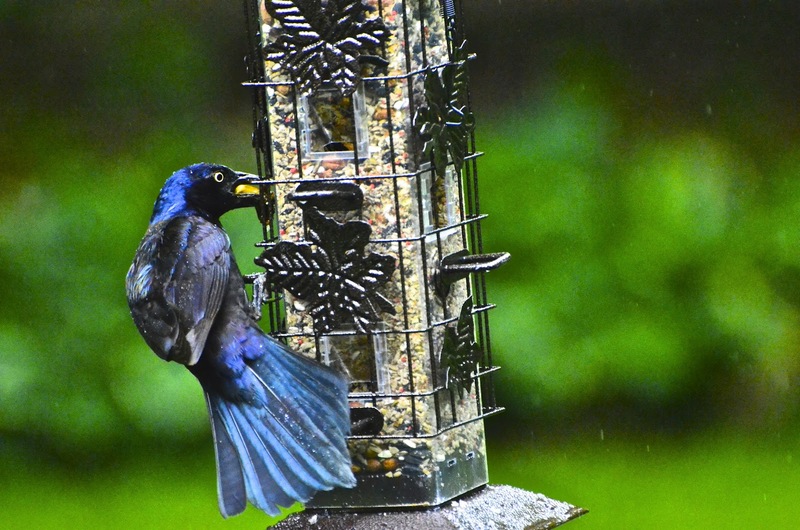 What fabulous shots of a beautiful bird...maybe he was just pigging out that day. I just looked at all your shots of Turkey...wow, beautiful! I know what you mean about all the stray cats and dogs running the streets....and that one cat that looked like a lion and THAT TAIL...omg poor thing. There is a photography book about cats in the Provence....maybe you know this book. What a great series! I love that first shot. 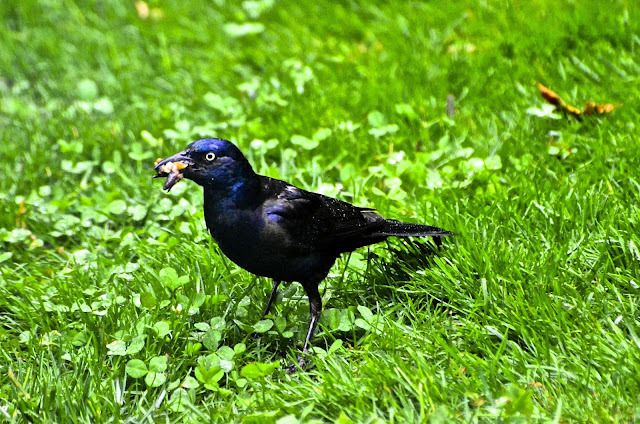 The Grackles around here are working hard to feed the noisy, screaming babies that are following them, begging to be fed. 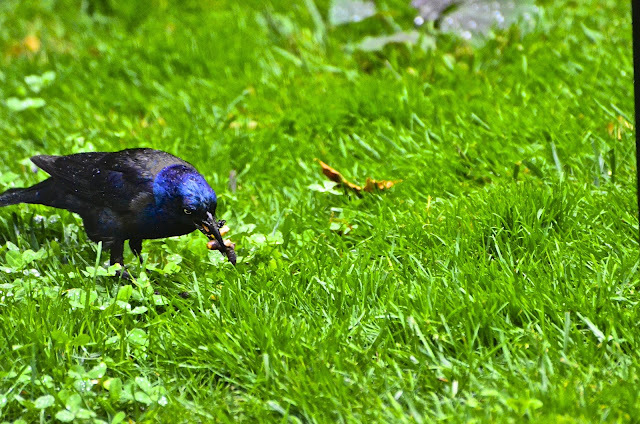 Great a bird style smorgasbord. I know humans like that, too. Ha! i always love your bird photos/stories. That is one greedy bird!